Well judgement day ended up happening a few days later than scheduled. Our appointment was supposed to be Wednesday afternoon but the vet called and said she was running an hour late. No problem, it happens. Then she called an hour later and said she was just called into a colic emergency. Also happens. We ended up rescheduling for this morning. I asked barn manager to leave him in this morning so he wouldn't be filthy for our 8:00am appointment. I got there early, and tried to give him a good brushing. He was so mad that all his buddies were out running around with out him that he was basically piaffe-ing on the crossties. I didn't want him to be a complete maniac for the vet so I decided to let him play in the indoor for a bit. Usually if I let him play in the indoor it's a quick once around canter and he's good. Today he ran for a good twenty minutes before settling down. I've never seen him acting and feeling so good and I'm pretty sure everyone in the barn thought I was nuts for getting a lameness exam on him. Ha! Vet showed up and I really, really liked her. She did flexions, his front legs look fantastic (even though I was concerned about some old, small, scarring on his knees), and he trotted off a little positive on both hind legs, but she said the change was SO small, that it was not something to worry about, and he could just be sensitive to the flexions. She didn't recommend xrays of hocks and stifles because she felt that they wouldn't show anything. She felt around his back and he was visibly very sensitive over his SI joint, which is exactly where we had the issue with his back last fall (per two chiropractors and massage therapist). 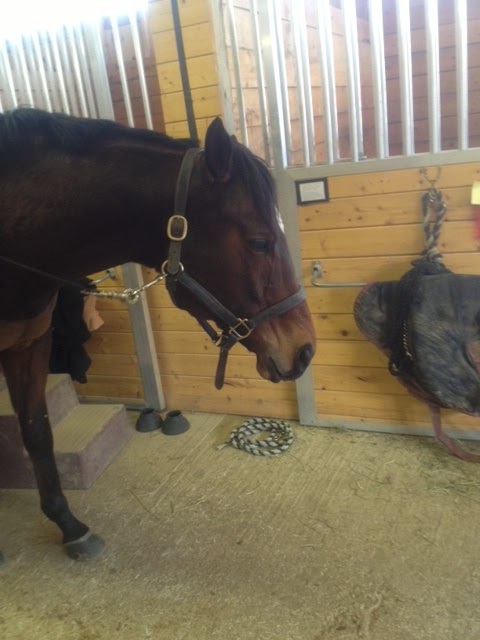 Everything I explained to her-- poor impulsion, reluctance to engage the hind limbs (especially in the canter), and difficulty holding up hind legs for farrier for an extended time, point to SI. Although none of these things were really horrible and noticeable, I always felt that he was protecting his hind end a bit by overusing his front end. After reading more about the SI, it makes perfect sense. We decided to inject to help the inflammation. After getting sedated and injected, he is spending today in his stall. Tomorrow he can go back out, and he can return to work in 3 days. After coming home and reading more about injecting the SI there's a lot of positive experiences out there, and very noticeable differences in their horse's comfort/way of going. The only negative I found is that without using an ultrasound to guide the needle deep into the SI there's speculation whether the steroids even reach the SI, if given by just another equine vet. The vet I used is one of the top lameness vets in the area, and does lots of SI injections, so I definitely trusted her judgement. I guess I will know within a couple of weeks if it did anything. Here's hoping! I hope they injections make a big difference! My vet is like yours- the best lameness vet in our area easily. And he does the si blind as well. I've had positive experience with the si injection with my last horse. Hope it helps him!